TEMPE – Stepping into the evening darkness from their silver Kia, a mother and her 20-something daughter walked toward the line of orange and clear bins filled with packets of fresh hypodermic syringes. The daughter, dressed in a college T-shirt, leaned against her mother as they waited for two kits of “short needles” and alcohol pads, handed to them by volunteers sitting in folding chairs at a Tempe park – volunteers who risk prison and a fine for their efforts. The volunteers work for Shot in the Dark, one of a handful of needle-exchange programs, also known as syringe-access programs, in Arizona for people who illegally use opioids and other intravenous drugs. The underground program provides such resources as clean hypodermic syringes, overdose-reversal drugs, needle disposal and treatment referrals. Shot in the Dark and similar Arizona programs try to avoid drawing law-enforcement attention to their operations, which are in a legal gray area. 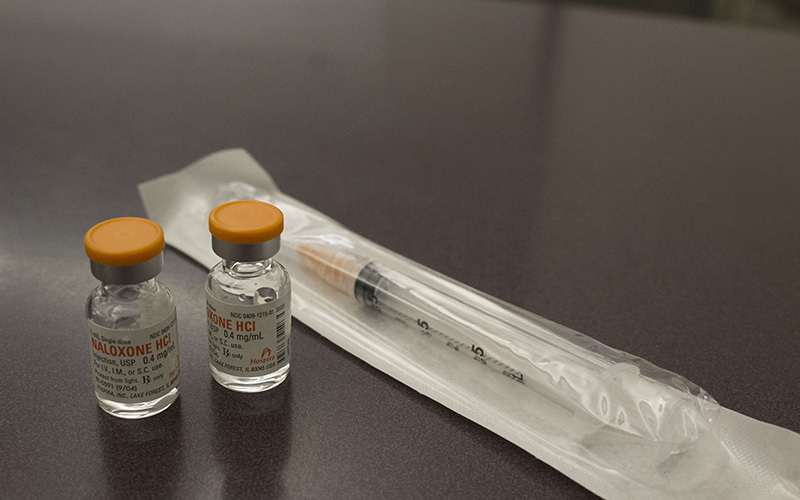 A bipartisan bill to legalize needle-exchange programs moved forward in the state Senate last week, but only after major revisions to the measure, which had passed the House of Representatives in February. The Senate version would require the Arizona Department of Health Services’ director to declare a public health emergency in specific jurisdictions because of a risk of infectious diseases being spread by shared needles. Once an emergency is declared, syringe-access programs would only be allowed to operate in those geographic areas. Rep. Tony Rivero, R-Peoria, first introduced the bill to decriminalize volunteers and recipients in the exchange programs, also known as syringe-access programs. At a House committee hearing in mid-March, Rivero said it is important to build relationships with people who use these services. “We need to reach people who are currently stuck in their addictions,” he said. 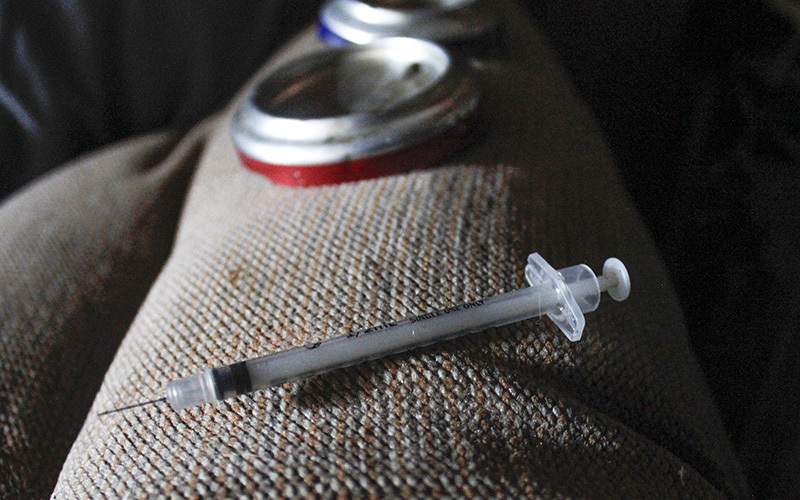 The House-approved version of the measure considered needle access programs lawful if they work toward “harm reduction,” such as bloodborne-disease prevention, encouraging people to seek addiction treatment and properly dispose of needles and syringes, according to the bill. Boardman acknowledged the risk she takes by possessing needles or syringes for distribution and disposal. Under current state law, any person who possesses or delivers drug paraphernalia, including hypodermic syringes or needles, can be charged with a Class 6 felony, punishable by a fine or up to two years in prison. Law enforcement officers are less likely to arrest volunteers but they have sometimes stopped syringe recipients, Boardman said. Technically, if a volunteer who had some program equipment in a car was stopped by law enforcement, the volunteer could be cited for what “technically counts as paraphernalia,” she said. On a recent Sunday evening in a Tempe park, intravenous drug users emerged from their vehicles, which covered the financial spectrum, from a dented van to a dark blue Audi. One by one, they took their place in line, seeming to know the drill. Because operations are mobile, marketing is word-of-mouth, Boardman said. Participants and volunteers contact each other by text. A middle-aged man approached one volunteer with a handful of needles for disposal, while a young woman asked another volunteer how to inject naloxone in case one of her friends overdoses on opioids. None were eager to discuss their drug use with Cronkite News. The mother and daughter declined to talk. One woman, Renee, who would not give her last name, greeted volunteers by name as they began to unload supplies from their car trunks. She grabbed a bin to help distribute syringes. She said she lives with hepatitis B and hepatitis C because she didn’t use clean needles. Dr. Christopher Luke Peterson, an addictive medicine physician with Banner Health, said needle-access programs are necessary to not only prevent disease, but also to cut overall health care costs, especially HIV and AIDS treatments. In 2017, there were more than 17,000 cases of HIV or AIDs in Arizona, according to an Arizona Department of Health Services annual report. The opioid crisis in Arizona and the rest of the nation also has spurred the syringe measure. Since mid-June, there were more than 6,500 possible opioid overdoses in Arizona, along with more than 1,000 suspected opioid deaths, according to the Arizona Department of Health Services. The crisis serves as a wakeup call that current laws are not working, said Haley Coles of Sonoran Prevention Works, a group working to reduce harmful effects of drug use in the community. She said syringe-access programs provide a low-barrier system to help people who are addicted, without judging their behavior or putting them at risk of being arrested. Kingman Police Chief Robert DeVries said the opioid epidemic made him look at exchange programs in a new light. Although he would have been hesitant a few years ago, he said the bill is necessary to diminish opioid use and reduce the number of dirty syringes officers routinely encounter on the job. “If we can somehow impact our HIV and hepatitis rates and at the same time be able to build a level of trust with these individuals and those who are assisting them, it could cause a longterm change,” DeVries said. But the bill, although supported by Republican and Democratic leaders, has detractors. Some opponents, including Maricopa County Attorney Bill Montgomery, have said needle-exchange programs condone drug use and increase the number of used syringes littering the ground. Montgomery’s office declined several requests for comment from Cronkite News. Cole said changes made to the bill during the House hearing require that programs match the number of syringes provided to users with the number of syringes users return, which should help keep the community clean of discarded needles and syringes. Boardman said Shot in the Dark collects contaminated needles for proper disposal, in addition to providing naloxone, condoms and treatment referrals. Now, Boardman said, such programs need the backup of the law to further help others. More funding and partnerships could emerge if the needle exchange program becomes law, she said.